Demerol, a brand name for Pethidine, is an artificially synthesized opioid. It is in common use as a strong painkiller (for instance during childbirth). It belongs to the phenylpiperidine class of medications and has similar effects to those of Morphine. The drug is also sold under the brand name Meperidine. Originally thought to be a safer alternative to Morphine, they have now established the drug as equally addictive. Furthermore, due to its slow release from the body, even more, toxic than other opioids. What are some Demerol addiction signs and symptoms? This guide will raise your awareness. However, you may need to do more research after. Like all opiates, Demerol is highly dependency-forming with regular use. The drug works by acting as an agonist at the brain’s the μ-opioid receptors. As a result, this creates an analgesic effect of euphoria, reduced anxiety and an immediate decrease in physical pain. The presence of opioids causes the central nervous system to change its workings. This way, it can maintain the brain’s delicate chemical balance. Demerol dependency occurs when the central nervous system has adapted to the drug and has trouble with normal functioning without the drug. In other words, withdrawal occurs when the brain no longer has a supply of Demerol. The manufacturer warns against psychological dependency. This is in the product monograph that’s supplied with the medication. There are a couple of indicators that you may be at risk of developing an addiction. First, it is developing an increased tolerance for the drug. Second, it is a physical dependency on it. We can call them Demerol addiction signs and symptoms. Therefore, you should carefully consider whether you want to continue use of the drug. Quitting now will be easier than quitting later. Are You an Addict of Demerol? Dependency is not entirely the same as addiction. In some cases, dependency is an indicator that opiate addiction may occur and it will probably occur at a later stage. However, the distinction between the two lies in the behavior of the user. The above is a check list for the classic symptoms of opioid withdrawal. The withdrawal itself is a symptom of Demerol addiction. Also, most doctors will include it in the criteria when checking for addiction. When more than one of the following are present, it may indicate an opioid use disorder. What are the Signs That Doctors Look for Opioid use Disorder? The Diagnostic and Statistical Manual provides insights into the conditions tested for when checking when Demerol addiction signs and symptoms are present. There is a notable change in definitions and treatments from DSM-IV to DSM-5. It is that the previously clear-cut distinction between Opioid Dependency and Opioid Abuse is now less apparent. In addition, experts now base the difference between the two on the number of criteria that the patient meets. Are any of these symptoms present to the extent that requires medical treatment? Have I had cravings for Demerol? Have I developed a tolerance for Demerol, where I need much higher doses to achieve the same effect? Do I have any of the effects of opioid withdrawal? Do I need to take Demerol or other opioids to relieve withdrawal symptoms? Am I using Demerol regardless of problems caused to my personal or work life? Am I using Demerol despite the negative impact on my relationships with others? Have I been taking Demerol for longer than my original script? Am I taking Demerol at higher doses (more than 600mg per day), or more frequently than my doctor prescribed? Have I previously tried to cut down or completely quit Demerol but failed? Am I purchasing Demerol from a doctor or from sources where I don’t need a prescription? Have I ever purchased Demerol on somebody else’s script? Am I using the drug in a way other than prescribed by a doctor (for instance smoking or snorting it)? Am I using Demerol in conjunction with alcohol or other drugs? Have I used Demerol in situations where it was dangerous? Has my use of Demerol caused me to give up important recreational, work or social activities? Dr. Phil O’Dwyer from Oakland University published a DSM-5 study on Opioid-Related Disorders. In it, he identified the following stages of addiction and remission. Refer to the above list of questions for psychological addiction. Prescription use of clinical opioids has increased by over 400% since 1999. However, heroin use has increased by only 8%. Researchers describe these inconsistent increases in opioid use to the availability of synthetic and prescribed opioids. It seems to be easy to get via the healthcare system and online. 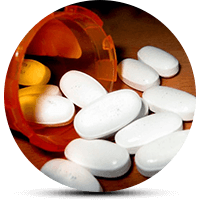 When one source or type of opioid becomes unavailable, a user can substitute it for another. Any of the above Demerol addiction signs and symptoms can be a red flag. If you notice any of these, you should take note and act quickly before it’s too late.